In these days of Ancestry.com and familysearch.org and a gazillion other websites, we tend to believe that all available sources are available at the click of a mouse, albeit, we might have to pay to make that click. But this is not the case; there are many many hidden gems which contain valuable resources which can breakthrough brickwalls in our research. 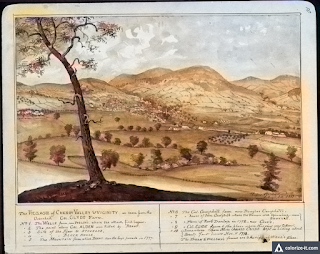 While researching my ancestors, who once inhabited the Mohawk Valley in New York State, before and during the American Revolution, I found reference to a source, called the 'Clyde Manuscript', which included the genealogy of my ancestors James and Catherine Thornton. I have searched the internet for this manuscript, referred to in a book, The Family of James Thornton, Father of the Hon. 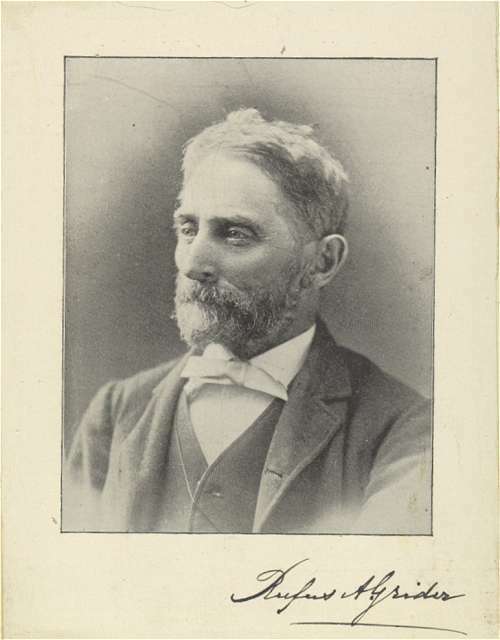 Matthew Thornton, by Charles Thornton Adams. This book was first published around 1903. My grandfather had a xerox copy of the book, which I read as a young woman, and treasure to this day. But, I had never found the Clyde Manuscript, until this year. It is part of the Rufus Alexander Grider collection in the New York State Archives in Albany, New York. Who was Rufus and what was he doing with the Clyde Manuscript? Rufus Alexander Grider was born April 13, 1817, in Lititz, Lancaster County, Pennsylvania. The town was founded by members of the Moravian Congregation in 1756. Grider was of Swiss descent and a member of the Moravian church. Grider married at the late age of 46, he and his family resided in Bethlehem, PA until he moved to Canajoharie, New York to teach art at the local academy. He retired in 1898 and died in February of 1900. 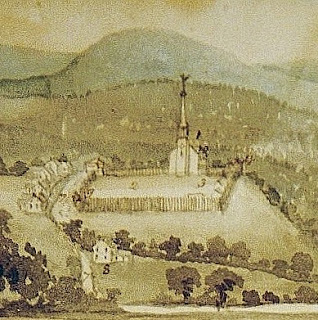 Grider's passion for recording the history of the Mohawk Valley began in 1886 when he sketched Johnson Hall in Johnstown, the former home of Sir William Johnson and Molly Brant and his Loyalist son, Sir John Johnson. For the next fourteen years Grider traveled the length and breadth of the valley sketching and painting water colors of important buildings and battlefields. He even drew buildings that no longer existed, based on the memories of Valley residents include old Forts long destroyed in the war. 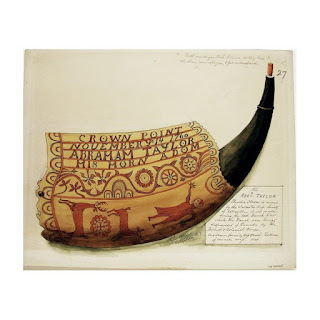 Along with buildings, Grider also drew pictures of powder horns, once prized possessions of Revolutionary Soldiers, many were intricately carved by their owners. Some include valuable genealogical information. According to the Albany State Archives, "By the time of Grider's death in 1900, he had compiled nine volumes containing 1,041 pieces, including 623 water color sketches, 42 water color portraits, 169 tracings of manuscripts, 81 original engravings, seven original manuscripts, 71 tracings of maps and plans, 23 photographs and 25 water color drawings of powder horns." One of the manuscripts is the Clyde Manuscript. Rufus Grider was drawn to Cherry Valley, site of the 1780 Cherry Valley Massacre, one of many atrocities committed during the Revolution. Samuel Clyde, his wife Catherine Wasson Clyde and his family resided on a hill overlooking the settlement of Cherry Valley. Their house, indeed the entire town was burned to the ground during and after the Massacre. 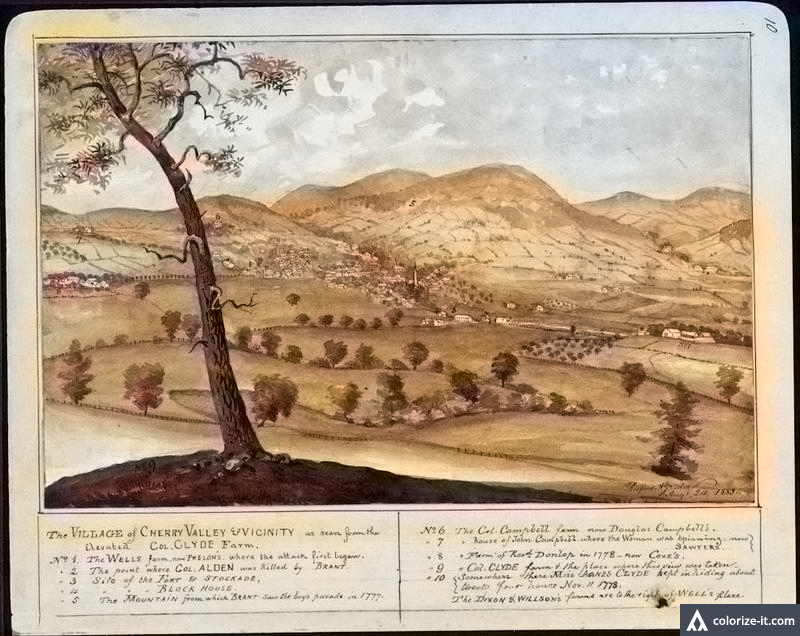 Grider drew the Valley from the Clyde home site and other points in the Valley, including the Campbell home site. Included in his collection were two further biographies, his commissions for the rank of Captain, Major and Lt. Colonel, his commission as Sheriff of Montgomery County after the war, relics, and portraits. A veritable gold mine of information, both historical and genealogical. The Grider archives contain articles related to many of the Cherry Valley families, including the Campbells. Colonel Samuel Campbell, friend and neighbor of the Clydes, fought at the desperate Battle of Oriskany. His wife Jane and their children were abducted and taken to Canada during the Cherry Valley Massacre. The archives include a Campbell family bible and Col. Campbell's powder horn. There is a long list names included in the archives, names like Bellinger, Wilson, Murphy, all with connections to the Valley and the American Revolution. There is a extensive list of items belonging to Timothy Murphy, the war hero and sniper who killed General Simon Fraser at the Battle of Bemis Heights. Murphy was the subject of the book, The Rifleman by John Brick. Deeds, commission and personal items belonging to the Vrooman family of Schoharie Valley. When Rufus died in 1900 he was survived by a brother and sister, his own children and wife having predeceased him. Upon Grider's death the archive came into the hands of a dealer who sold them to W. Pierrepont White of Utica, New York. They were sold to the New York State Archives in 1941 by his heirs. That being said, there are many Grider paintings, drawings and artifact that are not in the archives. The Van Alstyne House in Canajoharie has several Grider works of art in their collection. Others are in private hands. If you google his name you can see many example of his work online. There is also a book available on amazon which includes many examples of his work. See: Rufus Grider in Color, by AJ Berry for more examples of his work. How do you access the collection? I was in New York over the summer, unfortunately I did not know about this collection until I got home to Texas. Very Sad! But, if you want to see the collection you must make arrangements in advance through Manuscripts and Special Collections. The New York State Library is located in Albany, New York. This is a link to the Rufus Grider Collection. Are you going to the Archive? Drop me a line, I have a laundry list of items for you to check for me! (Philadelphia: Dando Printing and Publishing, 1903). http://www.nysl.nysed.gov/msscfa/vc22932.htm : accessed 29 December 2018). see manuscripts and special collections.